Established in 2014, our law firm has quickly become the trusted source for many across the region. We have earned this level of success by always providing the quality, personalized attention our clients deserve while aggressively pursuing the most favorable outcomes for their situations. Backed by our extensive legal experience, we can help increase your chances of obtaining the positive results you seek efficiently, and we promise to remain accessible throughout all legal proceedings to address your questions and concerns promptly and thoroughly. 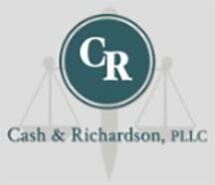 To schedule a free 30-minute consultation regarding your matter, you can contact Cash & Richardson, PLLC, by calling our office or visiting our website.